Satya Nadella may have abandoned his prudent approach. The Microsoft chief executive’s $26 billion deal to buy LinkedIn could reinvigorate the software giant’s slipping grip on corporate computer systems and employee interactions. Paying a 50 percent premium for a flawed business raises several red flags, however. The Windows operating system and Office software suite once gave Microsoft a chokehold over corporate computing. But the growth of the cloud and mobile devices has thrown the market wide open – first to alternative operating environments, and more recently to new collaborative software that threatens Microsoft’s email, word processing and spreadsheet revenue. The company’s efforts to move users to cloud versions of its programs may help, but its traditional dominance is under attack. Buying LinkedIn means Microsoft will control the best-known network where companies and employees – especially potential employees – interact. Making the LinkedIn bazaar operate smoothly with tools like Office, Skype, and other services run on Microsoft’s Azure platform is the overarching vision. LinkedIn has problems, though. 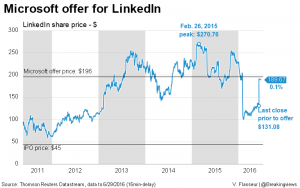 Less than a year ago, its stock was trading nearly 30 percent higher than the agreed offer price of $196 a share. A growth warning, the reputational damage of a massive security breach and the introduction of new features that provide revenue but annoy users have hurt the company. The board’s decision to sell suggests the stand-alone outlook was not especially alluring. Meanwhile, Microsoft’s M&A history raises questions, too. It has written down essentially the entire $9.5 billion it paid for Nokia. In 2012, it wrote off nearly all the $6.3 billion shelled out for digital-advertising agency aQuantive. Those deals were sealed by Nadella’s predecessor Steve Ballmer, and it may be the current CEO will prove more attentive to integration. But the LinkedIn deal is the biggest Microsoft has ever attempted. Making such transactions pay off is tough, especially when the seller’s adviser, Frank Quattrone’s Qatalyst Partners, is known for scoring improbably high prices. It’s also hard to see past the press-release drivel. Nadella says the merger could boost growth as “we seek to empower every person and organization on the planet.” As for LinkedIn, “today is a re-founding moment” according to co-founder and board member Reid Hoffman. Concrete indications of the deal’s financial benefits are in worryingly short supply. 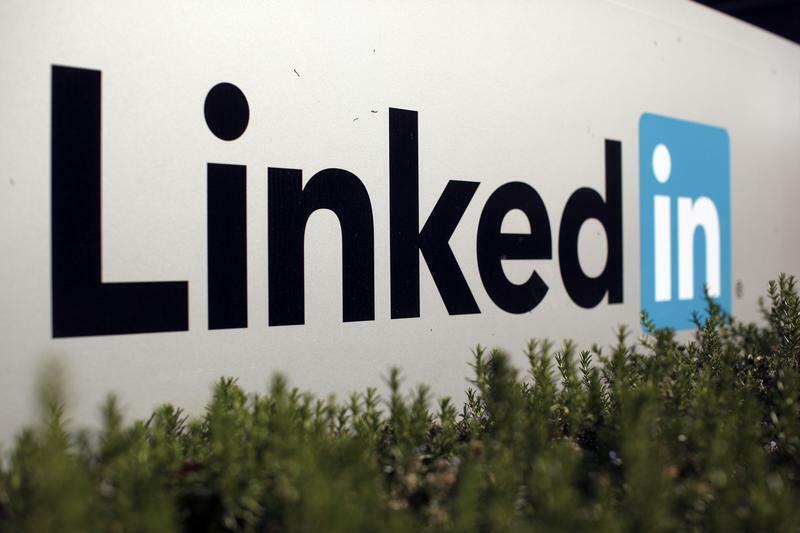 Microsoft said on June 13 it had agreed to buy LinkedIn in a transaction valued at $26.2 billion, or $196 per share. That is a 50 percent premium to where the professional social network’s stock closed on June 10, the last trading day before the announcement was made. “Together we can accelerate the growth of LinkedIn, as well as Microsoft Office 365 and Dynamics as we seek to empower every person and organization on the planet,” said Microsoft Chief Executive Satya Nadella.